We love Rojak, but we don’t like the pungent taste of shrimp paste/hae ko, and here we are today. We came from a non F&B background. The first impression as a young generation does little help to be convincing at the initial stage that we are more than capable in creating the finest Rojak, as some may argue that age->experience->skill->expertise. While experience is an important prerequisite to become an expert, it does not necessarily metamorphose someone into an expert. We believe that it is when the desire to keep improving any product/service, coupled with the ability to execute together with experience and then someone may become an expert in his/her field. Most people would know what Rojak is especially for people who live in South East Asia. It’s one of the popular dishes in South East Asia. We’ll just touch on real quick to introduce what Rojak is, and reintroduce Rojak for all in the rest of this article. Rojak is a word from Malay, which means motley/medley/mixture/variety. In food context, Rojak is a dish with mixture of fruits, you tiao (dough fritter) and tau pok (bean curd) together with Rojak sauce and sprinkle with peanuts grits. Anyone in the market can proclaim its product/service is the ‘finest’, and hope that consumer will project the image of ‘finest’ for their product/service, but anything without solid ground to support its claim is just like a sky villa built without a solid foundation. We believe that paying attention to every details is the key of creating the Finest Rojak. The majority of the rest of the paragraph are to manifest how we walk the talk. 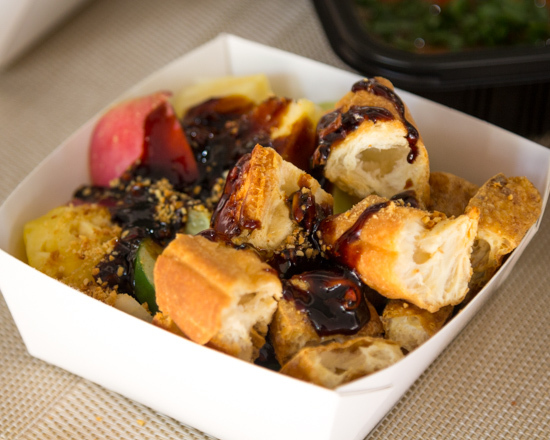 Rojak sauce is considered as the most important litmus test on the tastiness of a Rojak. Or simply put, Rojak sauce dictates if the Rojak is worth mentioning for. And when mentioning about Rojak sauce, perhaps many people will still think about shrimp paste/hae ko. We are hesitant to discuss about this issue in the first place, but it is like an elephant in the room that we think it is appropriate to discuss about. It’s important to note that the article is not out for smearing whatsoever. Many people syncretize the concept where a good Rojak sauce is equivalent to having a good shrimp paste, and said it interchangeably. It’s a nuance concept similar with the greatest villain actor must carry a big scar on his face, and big scar actor must be a villain. It may be true in 50-80s non sci-fi/cartoon movie, but it is not the case anymore. And things get dicey when there are two types of shrimp paste in the market that carry the similar name. The one that is commonly used in traditional Rojak across South East Asia is called shrimp paste (black color)/hae ko/petis/otak udang/xia gao, while shrimp sauce/xia jiang (pinkish color) is the one commonly used in shrimp paste chicken/prawn paste chicken/har jeong gai. 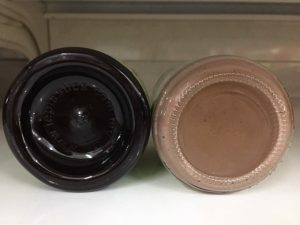 It can be confusing for many people, as the taste of this two shrimp paste are different, but it has similar name. The traditional Rojak incorporates shrimp paste/hae ko/petis/otak udang/xia gao, with abundance of white sugar and peanut, some tamarind/assam, ginger flower and lime. 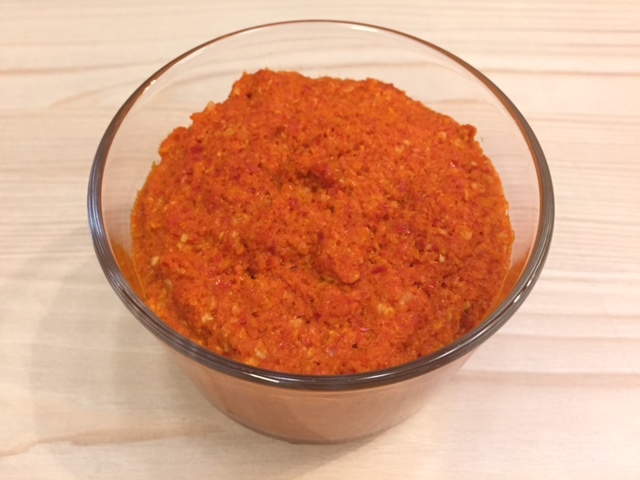 In our opinion, the pungent taste of shrimp paste/hae ko/petis/otak udang/xia gao is the key pain point that needs to be dealt with, and the above ingredients will be only able to cover about half of the pungent taste of shrimp paste. We believe that ingredient like ginger flower and peanut should add to the goodness of the taste, instead of helping to reduce the pungent taste of a dish. We eschew shrimp paste due to its strong pungent smell, we choose to create our own secret recipe to expel the pungent taste of shrimp paste while retaining the unique flavor of the Rojak. And because of the Rojak sauce does not contain shrimp paste/hae ko, it is suitable to Vegan and Vegetarian consumer as well. Would a Rojak without shrimp paste/hae ko taste good? To us, the real question should be: Would a Rojak with shrimp paste/hae ko taste good? The ohm factor of an excellent Rojak is not derived from the shrimp paste itself, but the overall absolute tastiness combination of Rojak when the exceptionally well-crafted Rojak sauce combined with the ingredients. The taste of ROJAK LINE’s Rojak sauce, together with chilled fruit, crispy dough fritter and bean curd, aromatic peanuts grits, is simply amazing. Essentially, the real authentic Rojak is the one that will make you feel loved when you tasted one. How to make the Rojak taste good with shrimp paste? Larger question: How to make Rojak taste good? How to make an object fly with flapping wings? Larger question: How to make an object fly? It’s the latter that creates aero plane, and it’s the latter that creates the real amazing Rojak/light bulb/smart phone (or any product/services). Asking the right and larger question often times means about challenging the status quo, trying to find out how could be better, or pull down what is believed to be right and pursue the truth. Many times it involves sunken cost and the mettle to change what historically was a successful product, and we are not hesitant to ask the right and larger question even so. 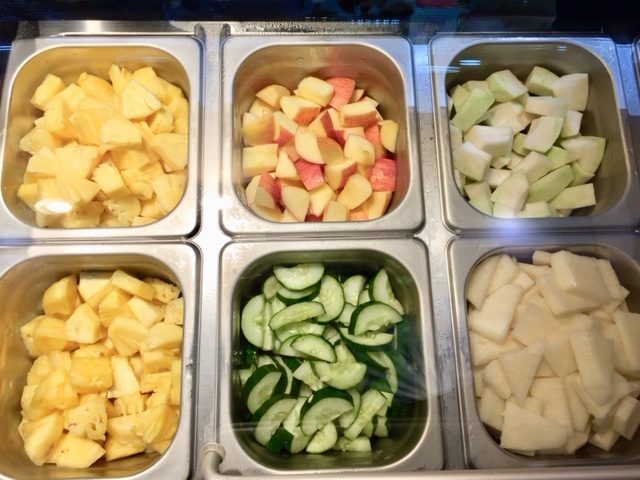 We choose Rojak ingredients based on the quality output- the tastiness of the ingredient. The emphasis is greatly placed on the quality, instead of the costing factor first. On choosing guava, we use ‘luo han’ guava – a premium Guava over normal type of guava. On choosing cucumber, we use japanese cucumber over normal type of cucumber. We have chosen a very good quality dough fritter (You Tiao) and bean curd (Tau Pok) after long time of searching for the best fitted dough fritter and bean curd. Both of it matched extremely well with ROJAK LINE’s Finest Rojak sauce. 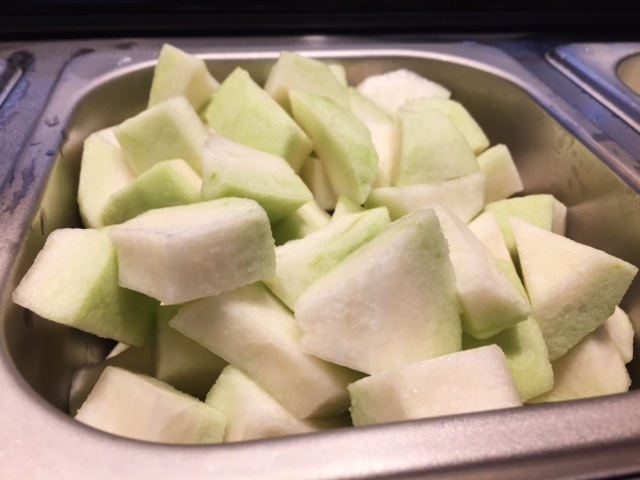 During the initial opening of ROJAK LINE stall, all the fruits are exposed at room temperature, and we’ll put it back to refrigerator once the crowd was over. We were worried that the fruits will become not fresh back then. We sourced out refrigerator supplier, and invested in the chiller to keep the fruits fresh and cool. As the first Rojak stall to use chiller, we are glad that chilled fruits in Rojak will taste better and fresher compared to expose it in the room temperature. All the chili used in ROJAK LINE are homemade, instead of getting it from supplier. We purchased chili with the supplier in the initial stage of operating, however we decided to get our hands dirty by making the chili on our own. It took hours to prepare the chili, at similar cost if compared with getting it from supplier. The cost will be in the contrary higher than the supplied chili if factored in the logistic and manpower cost. We would not go to this extra miles if not because of the taste is much better. Homemade chili retained the fresh aroma from chili itself, and it is not adulterated by any food addictive. It is fresher and blends well with ROJAK LINE’s series Rojak for those who loves to have spiciness in Rojak. We believe that a well toasted dough fritter (You Tiao) and bean curd (Tau Pok) are indispensable in a qualified Rojak. 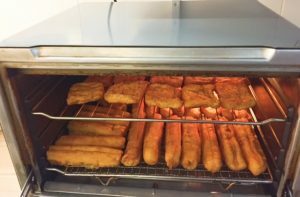 For this particular reason, we have to let consumer to wait for at least 7 minutes for us to toast the dough fritter and bean curd, to make it crispy. The waiting time of toasting sometimes is long for both consumer and us, but it is a time well waiting for. We would not serve the Rojak just for the sake of hastiness, but at the expense of the quality (under-toasting) of you tiao and bean curd. The taste of dough fritter and bean curd is in their best form while it is hot. Hence it is advisable to consume it as soon as you could. We believe that hygiene practice should be the first barrier to cross for any given food stall/restaurant, before entering the topic of discussing about the tastiness of the food. Hence, it is utmost important to handle the food in the most hygienic way. It is part of the DNA in ROJAK LINE culture. Generally, ROJAK LINE price is higher than the rest of the Rojak outlet. It is this higher price margin that allows ROJAK LINE to serve the customers on the quality of ingredients, and thereby producing the finest Rojak to you. 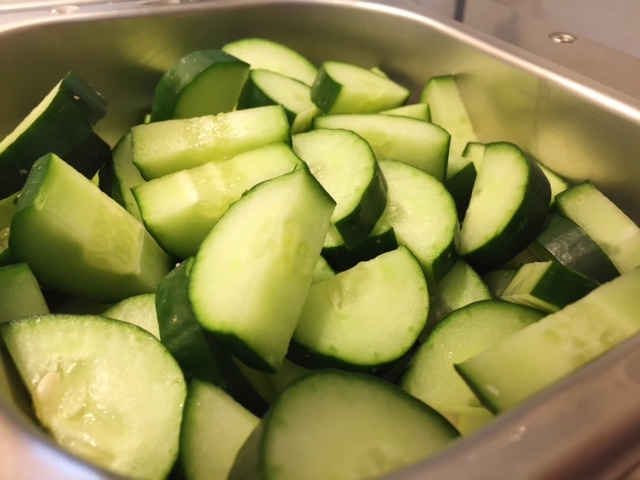 It is our principle of producing wonderful food at a fair price, rather than a fair food at a wonderful price. It is worth mentioning that food is something that is consumed in the body. In many ways, food industry is similar with pharmaceutical industry. It’s the effectiveness (tastiness) of medicine (food) that matters. It is not in any way that we agree that the price can be charged exorbitantly high due to this factor, it is just a way to advocate more to judge the value of the food quality vis-à-vis price. Great food is just like any great music or movie. It will just make your day when you encounter one. We are always in pursuit of creating great Rojak in particular, great food in general. If you are looking at the best Rojak, this is everything that you wanted. © Copyright of ROJAK LINE. All Rights Reserved.